Given the lightning pace of business at medical device, pharmaceutical, and biotechnology firms these days, it’s no wonder that more and more companies seek talented, experienced consultants who can quickly ramp up to work on critical projects. EG Life Sciences partners with life sciences companies to locate top talent to meet this demand and works closely with consultants to match them to these opportunities. 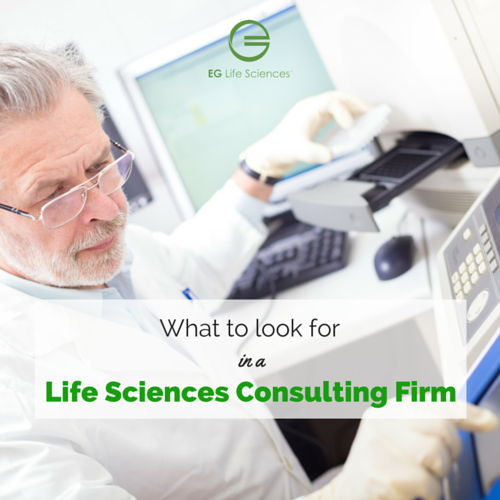 As a consultant, we know that there are many options available to you when trying to locate a great life sciences consulting position but they certainly don’t all yield effective, favorable results. So how do you evaluate your recruiting options to ensure you are exposed to the right companies and positions? Dana: Dale, you have been a consultant in the medical device space for quite a while now. What are your top recommendations to others who are considering a shift to consulting or seeking a new role? Dale: Consultants, particularly those who are less experienced, should work with recruiters who are willing to submit them for positions that may be a bit of a stretch for them. Obviously, your skills must be related and transferrable but it’s important to seek positions that will take your career to the next level. Recruiters who are only willing to submit your resume for positions that closely match what you are doing nowmay not have your best interests in mind and also may not be very knowledgeable about the positions and clients they are working with. Great recruiters have strong relationships with their clients, ensuring they can confidently and effectively work on your behalf. Dana: What advice would you give to those who are considering making a switch from full-time employment to a consulting role? Dale: Be open to new opportunities that might be different from what you have done before. For baby boomers approaching retirement years to those seeking additional flexibility, the prospect of transitioning to a part-time position is appealing. From working shorter schedules to working 9 months out of the year vs. 12 to working remotely, there are many more options available to consultants that full time employees are typically unable to take advantage of. Although you may have spent years working full time, consulting might open up new options you have never considered before. Dana: What kind of support should consultants expect from recruiting firms? In return, consultants should be completely honest with their recruiter partners, making them aware of any concerns, changes in status and future plans. As a consultant, you may receive multiple calls from different recruiters within the same firm. But I believe that having one specific recruiter who works hard to establish and maintain a strong relationship both with consultants and clients is the best way to go. If your experience with that one recruiter is not a positive one, you should certainly ask to work with someone else at that firm but having that one point of contact is extremely important and beneficial. I also find that having access to a community of consultants in the medical device field is extremely valuable. Firms like EG Life Sciences that offer events and other perks where you can connect and network with fellow life sciences professionals definitely add value to the consultant community. Dana: What questions should consultants ask when evaluating potential recruiting partners? Does the consulting firm’s ‘brand image’ fit with the brand you want for yourself? Is the firm established and not a “fly by night” agency? Does the firm safeguard control of your resume distribution and not share with anyone without your authorization? Is the firm a prime agency with the client and not simply a resume collector? Does the firm have multiple clients staffing projects currently? Does the firm have a confident standing with the client such that they will advocate for you and resolve problems if they arise? Does the recruiter understand the job and the skills they are recruiting to fill? Do you have questions about transitioning from a full-time to a consulting role in Life Sciences? If so, we’d be happy to answer them. Reach out to us at: info@eglifesciences.com.